Information and updates for the "Le Royaume des Ombres" mod by Xaphan. If you have any questions or suggestions for these mods, please post them here. This topic list all updates to the mod that have already been released. You can check what I am currently working on on this topic. - After updating to this version, your character will loss any benefit from strength and dexterity. This is happening because bonus from strength and dexterity are now bound to your weapon, and previously created weapons do not have this bonus. To solve the issue, please equip a weapon found in the game once you have installed the update. - After updating to this version, you may seem not gaining fame anymore. This is due to changes to cost of Path skills. Keep playing and kill monsters to start to get fame again once you have gain enought fame to compensate for the new costs. - Reward always 2 items, at least magic quality. - Reward always 4 items, at least magic quality. - Reward always 6 items, at least magic quality. - Any item found BEFORE upgrading to this version will not be upgradable anymore after you install this version, even if the upgrade slot wasen't used. The upgrade slot on theses items will still be showed but you won't be able to upgrade the item. Any item found AFTER upgrading to this version will work fine. Re: What's comming next ? Check here to see ! What's comming in 2.01 ? Act 2 will be improved. Some bugs will be fixed, and some new content will be added. Some maps will have more variations than they have now, mostly caves for now. The goal is to make this act different each time you play, as it is for act 1. Maps variations will be added slowely in each update, and only when it's totally finished, I will work on act 3. Currently, they do not, but they will in the next release. Yes, that mean news unique items ! Unique items are always something really apreciated by players, and the mod currently only have the soul system to get them. While this version will not see the introduction of unique items you can drop, this is still something that will come soon. Some properties of theses items aren't really how I want them to do, making some of them too strong, or not enought. While properties of theses items will not change, I will change some numbers. Any items you had before this update will not be altered, but any item you drop or make after this update wil have the new stats. Yes, you readed it right ! Set items will be implemented in this update ! There will be generic sets that are designed to be used by every class, and some class specific sets. While generic sets will have some general bonuses, class specific ones will give bonus to some skills or even to a whole mastery. There will be 27 sets avaible, designed for players of level 10 to 30. Will you complete thems all ? Check the following pictures to see some of thems. While veteran monsters are a stronger version of normal monsters, elite monsters will be a stronger version of... champions and rare monsters ! Beware, they will be deadly and challenging ! Well, champions and rare monsters will be tonned down a bit, but elite monsters will be more difficult than what champions and rares monsters are now. The way you can equip items in the mod is going to be modified. Instead of being bound to the items that need the path you have choosed, you will be able to equip every items that are at the level (or lower) of the level of your path. Every path skills will improve a new stat called 'Gear level', and that's the gear level that will determine wich items you can equip or not. That mean for exemple that a Sorceress with 5 points in the Offensive magic path skill will be able to use ANY item with requires a gear level of 5 or below, including bows, heavy armors, swords, etc... This have been done in order to give the player more freedom and open more builds. Also, walk/run speed have been increased, and weapons nd armors will show additionnal bonuses/malus : weapons will show the bonus to damage they got from strength and dexterity, and armors will show the malus to the player move/attack speeds they involve. What's comming in 2.02 ? 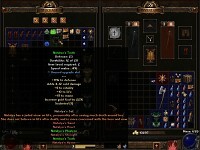 Players will be able to craft their own set items, to help them to complete the sets they may have found while playing. This will allow them to use unwanted set items to transform them into more usefull ones. Let's say you have found 2 items from set A, and one from set B. unfortunately, set B is not usefull for you, but set A is. You will be able to salvage the item from set B, and with the crafting material you get, you will be able to craft an item of your choice from set A. This will be very usefull when you only miss one item from a set to complete it. Also, the main reason of this change is to make a purpose to complete sets. As you may know, in most case once you finally complete a set, it is too weak for you in the unmodded game. This new way to aquire set items is here to help fix this issue. Artefacts have been improved in two ways : Firsts, they got some change to theirs stats, and some of thems also get one more added magic properties (They now all have 5 properties, plus the bonus one). Second, the random bonus they may get have been changed. They now choose a bonus in a pool of 30 possibles ones (with various chances to apear), including some that were not able before. As there is only lesser artefacts in the game currently, they have all the sames chances to get the sames bonuses, but later, once greaters and divine artefacts will be added, theses ones will have a different pool of bonus. An other change have been made to the system : Mystic formula will now drop in specific acts. The more you progress, the more the artefact you will be able to craft will be powerfull. Also, items needed to craft tha artefacts are based on what can drop in the act the recipe is allowed to drop. In other words, when you found a mystic formula, that mean all you need to do the formula can be droped in the act you'r in. 7 news magic properties will be added to the game. If you have ideas for more, you can submit thems, and I may add them if possible. The new magic properties that are going to be added are : +x% damage vs veterans monsters, +x% damage vs champions monsters, +x% damage vs elites monsters ,+x% attack rating vs veterans monsters ,+x% attack rating vs champions monsters, +x% attack rating vs elites monsters and Reduce cooldown on all skills by x%. The last one (reduce cooldown) can only appear on specifics items, and as completed set item bonuses. Like it had be said in the previous update, futher improvements will be done to act 2, including more variations to the first half the the outdoors area, the introduction of 2 optional areas with a boss in each, and the souls and unique items related to theses boss. Theses 2 area will use a tile set never used in the mod until now. * Increased volume of all musics. Use the options to set it at the value you want if it's too high. * Fixed a crashing bug that happen sometimes when the player try to enter the 1st and 2nd levels of Alcarnus sewers. * Fixed a crashing bug that happen sometimes when the player try to enter the 2nd level of Xiansai cave. Any formula or artefact you may have before updating will not get the new stats. While you can't do anything for the artefacts themselves, the formulas will work even if the olds stats are still diplayed on thems, and you will get an artefact with updated stats. Version 2.03 will be very small. It's a quick emergency bugfixes update I'm releasing very quickly, to fix some bugs that happened with version 2.02. Some of theses where game breaking, other aren't, but better fix thems. i'm releasing this as an emergency patch because the next planned update will take time to be done, and I don't want theses game breaking errors to stay in the mod until next version come out. If you have downloaded 2.02, please download 2.03 to fix theses bugs. Sorry for the inconvenance. What's coming in 2.04 ? It's sometimes boring to have to pickup all the gold on the ground... but that's not needed anymore ! Now, gold is automatically added in your inventory when you kill monsters. Also, the squantity of gold you may get and the chances for you to get any gold increases with the moster level as well as is rang (normal, veteran, chanmpion or elite). But beware ! Do not die with gold on you, or you will lost all of it. Put it in your stash, it will be safe there. Did you ever wanted to be able to make the items with the bonus you want ? If yes, then you will be happy ! Enchantable items are a nex quality of items that come with no bonus when you drop thems, but can be enchanted a certain number of time (3 most of the time, sometime 6). Each time you enchant an item, you can add to it the bonus you want. To enchant an item, you will need to colect (or buy) reagents all around the world. You then combine a reagent with the item, and voila ! You'r item gain the bonus that was on the reagent. There will be 2 big changes to skills : First, as of now, some skill can be spamed and deal an incredible amount of damage due of this. Many skill that lack a recharge timer will now have a small one (but remember you can reduce it with items than reduce couldowns). This should help to balance the game. Some skills may get a boost to compensate. Second, general balance will be done so that the weapon damage are more usefull. Monsters will have less life, but you'r mastery bonus will be greatly reduced. Than mean that the damage of your weapon will be more important than before. As of now, hireling aren't really effective. They are going to get new skills in this update, and will deal more damage. Then will also gain some passive skills while leveling up. Lastly, they are going to move faster, so they will always follow you correctly. The last thing is also true for minions skills. The way specialities act as of now are good, but not as good as it could be. The whole system will be reworked to give the player a new experience. The bonus will be more of what passive skills are in diablo III. For exemple, one speciality will increase the duration of all your buff by 100% and give you a bonus while under a buff. An other one will increase the number of minions you can summon. That's only exemple, and more on that will be revealed when it's time. End act boss battles will be improved, to make them more interessting. Bosses will have new powers and will be more intelligent and aggressives toward you. You have been warned! * Gold is now automatically added to your inventory when you (or any minion/other player) kill a monster. Chance and amount of gold you get depend of monster level and it's rank. * Minions dosen't have a delay between theirs attacks anymore, allowing thems to be more reactive. * Added 44 news specialities, grouped in 7 tiers. You can choose only one speciality per tier. * Mics items (Relics, Runes, Gems, Reagents, Scrolls, Orbs, Dyes, Mystic formulas, Keys, Amunitions, Class runes and Crafting materials) now drop separately from weapons, armors, amulets and hirelings items. - Now drop 6 items the first time you kill one, all rares or better. Subsequents kills work the same as a superunique monster. Note : Before updating, please delete or sell all spears and reagents with the replenish quantity propertie on your character AND stash. If you do not, your characher will be incompatible. To be safe, please delete or sell thems. What's comming in 3.01 ? Flails are fasts weapons that have a very high damage range. They will be the one handed weapon that can deal the higher damage, but they have also one of the lowest minimum damage. New recipes will also be added so you will be able to craft theses news types of weapons the same way you can craft the other ones. In addition, 10 new runewords will be added (5 in act 1, 5 in act 2) that can be done on flails. 9 news sets with each 6 items will be introduced and will drop in act 3. They will be the most powerfull ones you will be able to get for now. There will be 1 set designed for each class, and 2 that will be more general sets. Superuniques monsters in act 3 will drop their souls, and you wll be able to craft some new unique items from thems. Magic find and gold find will now be much difficult to get on your gear. It will only be avaiable on sets, uniques and runewords, and in limited amounts. However, you now get up to 75% magic and gold find with your Path of victory skill. 5) Less time in your inventory, more time for fight ! This update will reduce time you have to spend in your inventory. To do so, improvements have been done for the relic and charm system : You can now combine thems as you want, and not only one part at a time. It will also be easier to craft. Salvaging some items with the right kit will directly give you a refined material. Less cubing ! Finally, some improvements have been done on items descriptions to make thems more clear on how to use thems. Minions tend to die quickly as of now. In this update, they will get a major buff, that should help thems survive longer : First, they will all have 25% chance to dodge attacks and spells, to compensate the AI issues. Second, they will have an highly increased amount of life, to help thems survive longer. Lastly, their defense will be improved as well. The goal is not to make thems so strong that they can clear the game for you, but strong enought to worth using and be helpfull. If you take care of thems by helping thems in combat, they will be an invaluable help ! This update will include more variations to some act 2 maps, as well as the introduction of 2 news optionnal areas with a new superunique monster in each. Like other superuniques, theses one will have a soul you can use to craft an unique item. - Removed his tower spell. - Glyphs are removed from the game. Make sure you don't have any in your stash as well as on your character before upgdating, else your character will be corrupted. If you used one or more glyphs on your armor, you do not need to worry about it. To be safe, make a save of your character before updating. - All potions will be converted. You do not need to sell thems. - All plans your currently have will NOT have an improved description, but any plans found or buyed after this update will. The plans you currently have WILL work, and if you use thems the description will be added to thems. The same is true for salvage kits. - Any items you have with lifesteal, manasteal, magic find and gold find will not be altered. - Your gear level will be lowered because of the modifications done to the Path of Victory skill. You may be able to not wear some items untill you put more points in the skill. * Crafting level no longer increases when crafting items. Instead, Players now have to colect Pages of training. * General skills usable with a staff or a wand no longer deal 100% weapon damage, but deal an set amout of damage increasing when you level up. Theses skills are now affected by specialities, might and both masteries. Characters created before this update will not be compatible. You will have to start over. Be sure to also clean your shared stash to prevent issues. Version 3.03 will mostly be a bugfix update. it will be small and won't add any features to the mod. This update will also prepare the mod for the future addition of act 4 in the next major update. To keep your character, delete every items that has skill proc properties on it. Casting a shield, releasing lightning or similar effects count as procs ! Players can now explore and complete act 4 ! This act is smaller than other ones and contain 3 quests. 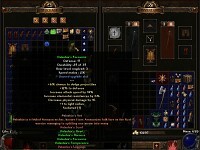 News superuniques monsters have to be found along with their own unique items. This act take place in one new tileset never used in the mod as well as an other one already used but altered. Items you can found while playing has been made more interresting. Previously, only unique, sets and runewords could get the max stats. Now, magic and rares items can as well. To balance this change, the drop rate of rare items has been lowered a bit. Unique and set items are now a littler harder to get than before, but they overall power has been increased. The wisdom stat currently increase the duration of many of your skills. In this new version, this stat will instead increase the power of these skills. Wisdom will make the following skills more powerfull : Enchantments, Hexes, Shouts, Stances Ward spells, Weapons spells, and Well spells. The base duration of these skills will be greatly increased to compensate. With the addition of act 4, 30 new runewords will be added as well. For now, these will be only armor related runewords (helms, torso armor, pants, gloves, boots and shield). There is 5 runewords for each item type. As always, you can find runic scrolls to learn these runewords. Act 4 also introduce 3 news artefacts with great powers. Find the mystic formula that you will need to craft thems and enjoy their power. What's new in version 5.00 ? 1. It's time to complete your adventure! Prepare to complete your journey in a completely new act! Act 5 will be added and many surprises are waiting for you. Will you be brave enought to enter the Realm of Shadows ? Bolts and arrows are both removed from the game, and replaced by quivers. Quivers can be used with all missile weapons such as bows, crossbows and hand crossbows. They can spawn as normal magic and rare, now have an upgrade slot, and the legend even tell that some unique quivers could be discovered. As it was the case with monsters charm in previous version of the game, this time it's relics turn to be updated. Theirs bonuses will be improved and made better overall and the completition bonuses will be improved as well. Gems are going to get a massive boost to make thems more interesting. Each gem will improve a specific stat, and the better the gem is, the more it improve the stat. You will also be able to put gems in any items, and not only some as it was the case before. This make gems dust and jewels obsolete, and as such, they have been removed from the game. Lastly, gems drops will be more accruately related to the area you are while you drop a gem. In this version, the shrine system will be completely redesigned. There is now way more shrines than before, but you never know what bonus you are going to get before using a shrine. Also, some shrines are more powerfull than other and givee you a super bonus for a short time. But beware ! Some shrines are cursed and will weak you instead. - All gems found before updating to this version will not have any properties on them anymore. You can sell thems, or combine 3 of them to get a higher quality gem AFTER updating to have a gem with stats on it. - All existing crafting plans are automatically updated to the new ones that only requires 1 Page of Blacksmithing. - Bolts are no longer used. You can sell them before or after updating. - Remove any gem dust and plans related to gems dusts and jewels before updating, else your character will be corrupted after updating. Again a small bugfixes update.